Credit cards offer convenience, security and rewards — but they’re not an absolute necessity. Some people choose not to have any credit cards at all, even though they could easily get approved. NerdWallet interviewed two families who have stopped using credit cards. One lives in a major city, the other in a small town in the Midwest. In both cases, they’ve used credit cards in the past but found that they were just more comfortable without them. They talked about why they stopped using credit cards, how their lives have changed, and how they get by without access to credit cards. Before his father died in 2014, Tahir Kelly continually worked at paying off his many credit cards. He had had a Discover card since his early 20s, plus a fistful of store cards: Best Buy, Target, J.C. Penney and Macy’s. But the balances always climbed back up. Tahir Kelly with wife Sharifa and sons (from left) Salim, Rafi and Eisa. His father’s death was a turning point for Kelly, who drives a garbage truck for a private company, and his wife, Sharifa, a teacher. Around the same time, Kelly heard about personal finance guru Dave Ramsey from a co-worker and jotted down the name. Soon Kelly was listening to Ramsey’s popular podcast, and the couple took one of Ramsey’s courses. “That is where we got the idea of using your own money for your emergencies instead of a credit card,” he says. Now he follows a modified version of Ramsey’s debt snowball plan. The family paid off the last of their credit cards early in 2016 and closed each account as they zeroed out the balance. Even though Kelly knows that closing credit card accounts after they’re paid off might lower his credit score, he’s not too concerned. He doesn’t plan on applying for credit in the future. Meanwhile, he and Sharifa are working on eliminating student loans and repaying a 401(k) loan. 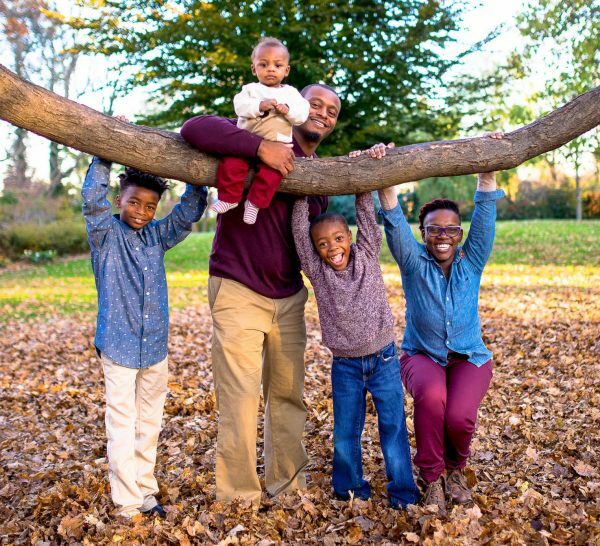 Now that he’s not relying on credit cards, Kelly uses dedicated savings accounts, sometimes called “sinking funds,” to save up for clothing and sports equipment for his three young sons or for date night with his wife. Instead of feeling limited by a lack of credit, Kelly says he enjoys how having less debt has freed up his income. “I find that not having credit cards, I end up having more money,” he says. Going without credit cards doesn’t mean carrying around a wad of cash. Kelly uses a debit card for most of his purchases. While debit cards provide much of the same convenience as credit cards, they come with their own limitations, which Kelly makes accommodations for. For example, credit cards and debit cards both offer fraud protection. But if your card is compromised, the inconvenience can be much greater with debit than with credit. That’s because fraudulent purchases on a debit card take money directly out of your bank account, which could leave you without money while the situation is being investigated. Your account could also be frozen while the bank sorts things out. This has happened to Kelly: His debit card was compromised, and it took a few weeks to get his money back. But because he had built up an emergency fund in a separate account, he was able to cover his bills in the meantime. Some travel purchases can also be more convenient with a credit card. For example, when we spoke, Kelly was waiting for a $75 hold on his account to clear. A hotel had placed the hold as protection in case of damage to the room. With a credit card, you might not even notice your available credit being temporarily reduced by $75. With debit, that’s money that belongs to you that you can’t use. But Kelly considers these minor inconveniences that are worth it. He recalls the first small emergency he experienced after he built up Ramsey’s recommended $1,000 minimum emergency fund. The door on his car broke, and he was able to pay $500 out of pocket to fix it — without having to pay credit card interest on it for months afterward. Instead, he paid himself back by replenishing the $1,000 fund. “I didn’t have to keep paying for this door,” he says. Like many new college grads, Zoë Keeland got a credit card for the wrong reasons. “I got it because I was broke, and broke people really should not have credit cards,” she says. After a job loss followed by a move, she found she couldn’t pay back the $300 she had spent on the card. But it was Keeland’s second run-in with credit cards that made her decide to avoid them altogether. She and her husband used a credit card to finance an expansion of a 420-square-foot studio on land that he owned, racking up a $7,000 balance. When they missed a payment, the credit card company raised their interest rate to 29%. Keeland and her husband entered credit counseling in 2006 and made an agreement not to use personal credit cards in the future. Since then, she has thought about what she might be missing by not having a credit card, but she’s more comfortable without one. “I’ve never run into anything I couldn’t do because I don’t have a credit card,” she says. She has never needed to rent a car and has no problem making day-to-day purchases or even buying plane tickets with her debit card. Her husband, who travels frequently for work, has a company credit card to pay for incidentals on the road. Keeland says she knows her credit score may be lower than it would be if she had credit cards, because using credit cards can do much to boost scores. But for her, having a slightly higher credit score isn’t worth the risk of getting out of control again. Her score is still above 700, high enough to borrow money when she needs to. “We don’t have problems getting loans,” she says. They have both a mortgage and a car loan, and were happy with the rates they were able to get from their local credit union. “Maybe someday I’ll regret not having a credit card,” Keeland says. But she’s afraid that if she did have a credit card, she’d eventually find herself in a tight spot financially and use the credit card when she didn’t have the means to pay it back. Virginia C. McGuire is a staff writer at NerdWallet, a personal finance website. Email: virginia@nerdwallet.com. Twitter: @vcmcguire.